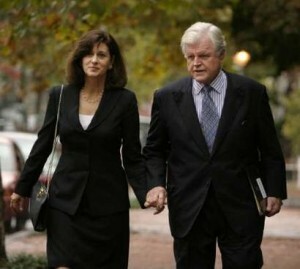 Vicki Kennedy, widow of Senator Edward Kennedy and Ted's sister Jean Kennedy Smith will travel to Ireland in June to visit the ancestral homestead and accept a major peace prize. The couple will visit the County Wexford home of the Kennedy ancestors in Dunganstown which was recently made an official historical site by the Irish government. They will also view the recreated famine ship the Dunbrody which is similar to the vessel the Kennedy ancestor Patrick Kennedy left New Ross in. The pair will also travel on to Tipperary to accept Ireland's most prestigious peace award there. The Tipperary Peace Prize will be awarded to the late senator and his sister Jean for their efforts to bring peace to Northern Ireland. Senator Kennedy, who died in August aged 77, and 81-year-old Mrs Kennedy Smith join an impressive list of previous winners, including Mikhail Gorbachev Nelson Mandela, Bill Clinton, Benazir Bhutto, Lord Robin Eames and Sir Bob Geldof. Announcing the award, organisers paid huge tribute to the Boston-born pair. The citation also stated that Senator Kennedy's role in the Irish peace process and Ambassador Jean Kennedy Smith's role in that same process when she was Ambassador to Ireland.